ah this is so awesome! 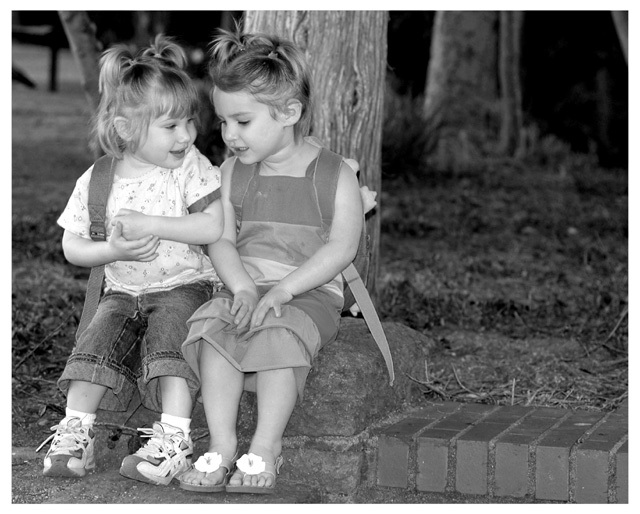 You did a wonderful job capturing the friendship between these two adorable little girls. Congratulations on your ribbon! Well, I am not going to turn down the blue, even if it was by default. However, I think I will strive to earn one before disqualifications :) Thanks to everyone for all the nice comments here. I really appreciate it. Made it to the top - Congrats! Though not the way you would have wanted it, but a Blue is still a Blue! Precious, and so deserving of your ribbon! Congratulations! Very much deserved Red! Congrats! Hey Darlene! Very nice work! Congratulations on the ribbon! Darlene: this is an outstanding image and glad it is a beautiful b/w because it helps with its projection and instantly hooks the eye of the viewer. Good work. Genuine and so cute, congratulations! BIG WOW! What was that about a slump? :0) Priceless photo Darlene, good job. Congrats on the ribbon!! Very Sweet! Congrats on the ribbon... This was one of my favs... No offense but I still think that the girls pictures towards the right while missing the bricks would have been nicer. Congrats on the ribbon, this was my fav. well done. im so sorry dear that i didnt vote for u during the challenge! u wud have been the winner had i voted! anywayz better luch nxt time! Congratulations on your ribbon ! What an amazing shot...well done. Congratulations, Darlene! I love the fact that the kids are interacting with each other instead of just looking at the camera. Really gorgeous shot. Congrats on another red, Darlene! Congrats Darlene on your second ribbon and a beautiful example of friendship! The winner in my opinion. The little hands on her lap, listening. How adorable. Very cute, made me smile. Definitely nailed the challenge :) I can just imagine what they're saying - good job! I wonder what they are talking about. Good work. One of my favs. in this challenge. Brilliant - of all the photos I have seen this one captures the "essence of the moment" between two friends - the expressions on the girls' faces is delightful. Great use of fill-in flash, good composition. Try to see what a close crop just on the faces will look like! I like this photo. Subjects are well lit and soft background does not distract from photo. This is a cute picture, but the composition feels better suited for a family album than a photographic competition. If I knew these kids I'd love to have this picture on my desk; but since I don't, there's nothing about either the content or technique that jumps out at me or gives the picture any real significance. Very cute picture! I like the idea of black and white for this picture. Good job with your placement. This is just a wonderful photograph. Cant think of anything I would change. The expressions on their faces are brilliant! Your ability to capture the emotion of friendship almost an anticipation is what makes this one good. THis was too dang cute. Great expressions! Awww this is darling. Great photo ! Wonderful picture. I like the softness. This was taken very nicely, its very sharp! The little girls look so cute. I aslo like the way it was taken in black and white. It looks great! A lovely shot of the girls... I would have given this a closer crop, rather than putting the tree at centre -- it strikes me as awkward. If you centred the girls, but put the tree at 2/3s...? Great shot: I love the expressions that you have captured. The whites (shirt, socks and flowers) seem a tad overexposed. Nicely done. so precious. I love it! Awesome composition and nice B&W. Very cute! Captures the essence of the challenge very nicely and genuinely, I think. A 10 from me. Great shot, it would be a good example to have on a "Friendship" card. This is totally awesome! The perfect lighting on the subjects is amazing. It reminds me of those old-timey greeting cards or posters. I just love it. Beautiful shot... a little over exposed though. Bricks are distracting. This is very nicely done! The black and white was the way to shoot this. Good work! Wonderful memories for these Best Friends. The expressions on their faces are pricess. The border matches contrast with the photo. I like it! Proudly hosted by Sargasso Networks. Current Server Time: 04/22/2019 03:58:25 PM EDT.